Having high quality tools in the kitchen is essential. 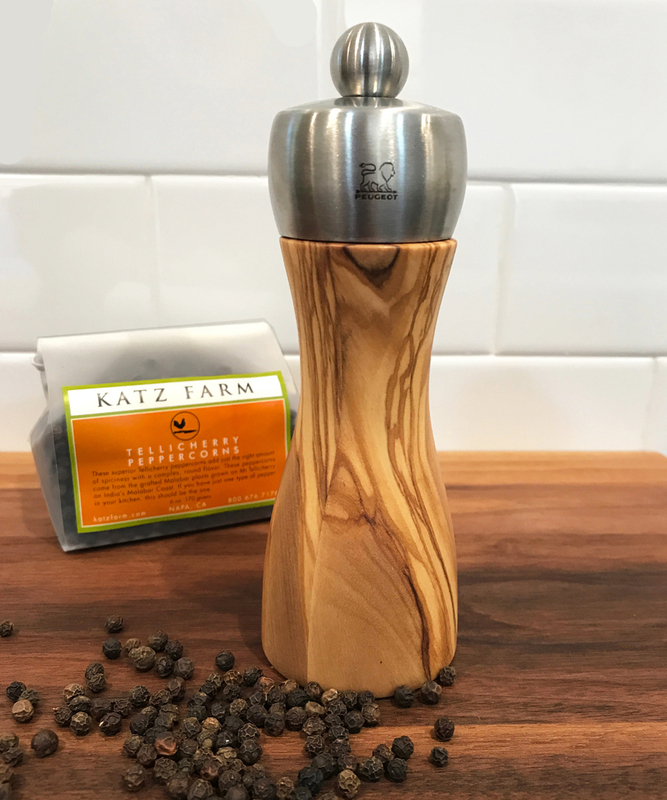 We turn to the classic French company, Peugeot, to provide a premium quality pepper mill to use with our KATZ TELLICHERRY PEPPERCORNS...each mill comes with a bag to get you started. Olive wood is an exceptional wood and a symbol of strength and longevity. Its incomparable grain and extraordinary natural lines make each mill a unique piece. Made in France, the olive wood used in the crafting of these elegant mills was sourced from sustainably managed European forests with respect for natural resources. Widely used by many of the world’s greatest chefs, Peugeot mills are renowned as the ultimate benchmark, for almost two centuries, in the art of grinding . Peugeot’s exclusive, patented steel mechanisms, provide users with unequalled grinding quality.